SMA(M) HHigh efficiency at 698 to 960MHz, 1561MHz, 1575.42MHz, 1602MHz, 1710 to 2700MHz. 360 deg. rotatable with durable brass hinge. The compact TG.08 with hinged rotatable SMA connector, is an impressively high efficiency monopole antenna, which provides wide coverage among cellular and GNSS frequencies. With its cellular and GNSS function, plus compact design, TG.08 can fit and function perfectly with routers, vehicle tracking devices, telematics devices, and remote monitoring systems. It is also ideal for use with cellular modules with Assisted GPS functionality that can be implemented in various devices. 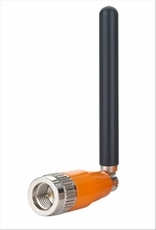 This 72mm long monopole antenna works efficiently from 700MHz to 2700MHz, widely covering 2G/3G/4G bands, as well as GPS/GLONASS/BEIDOU. At its maximum efficiency when connected to ground plane, it can achieve 73% and 67% at GPS and LTE bands, respectively. As all monopole antennas, TG.08 works best while connecting directly to the ground-plane of the device main-board, or with the device's metal enclosure. The robust brass hinge enables TG.08 to be oriented in all directions, providing users to maximize performance with minimum effort.